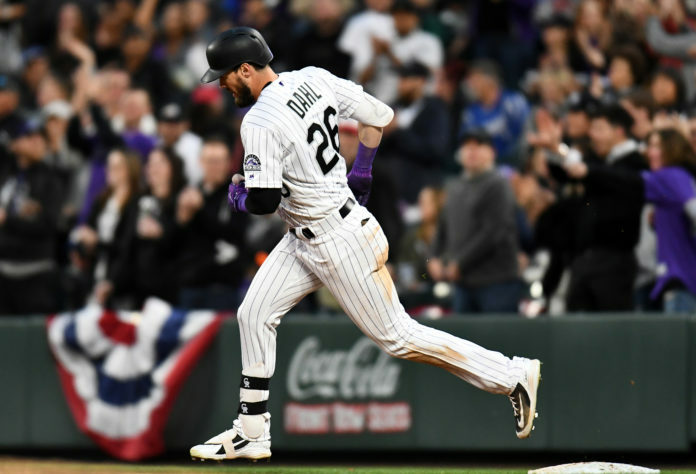 The hits keep on coming for the Colorado Rockies, this time in the form of their young outfielder, David Dahl. Colorado announced on Tuesday that they have placed Dahl on the 10-day injuried list with a left-side core injury. Dahl suffered the injury Sunday night after a first inning strikeout against Dodgers pitcher, Julio Urias. The Rockies starting left-fielder reached for his side immediately after his swinging strikeout and was subbed out for Raimel Tapia an inning later. Rockies manager Bud Black mentioned in an interview with ESPN on Sunday night that he was hoping it was just a “tweak,” but Dahl’s injury appears to be more serious than that. In 10 games this season, Dahl is currently hitting .343 to go along with two home runs and six RBI’s. Dahl currently leads the Rockies in batting average and on base percentage (.385) as Colorado now has six players on the injured list. With Dahl heading to the injured list, the Rockies have recalled Yonathan Daza, who will be making his first career appearance on a major league roster. Daza has played in four games with the Albuquerque Isotopes this season in which he has five hits, one double, one RBI and two walks. Just last season, Daza was named a mid-season All-Star in Hartford with the Yard Goats. Daza is a native of Maracay, Venezuela, and was originally signed by the Rockies as an International free-agent back in 2010. Daza will wear number 31 and will be the first Rockies player to do so since Kyle Freeland wore it back in 2017. Freeland now wears the number 21 after making the switch last season.